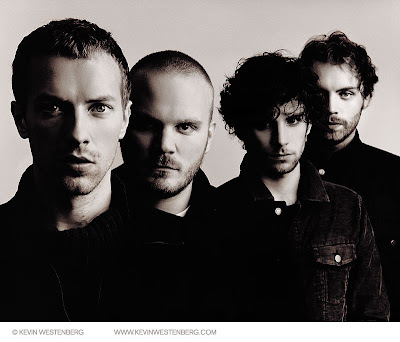 Rebekah Westover Photography: Hello Coldplay. I love you. Hello Coldplay. I love you. Oh my gosh, I am dying. DYING over the greatness of tonight's concert. What can I say about one of my favorite bands ever??? Let's start by saying they don't disappoint!! The concert started out with Violet Hill. Aaaah, such a lovely song. The band was so full of life and put so much energy into the entire performance. Chris's piano solos were truly amazing. I loved EVERY minute of it. But here was the highlight of the night for me. Viva la Vida came on about half way through the concert. Of course the crowd went hysterical. So in our hysterics my husband points to the exit/entrance gate RIGHT by our seats. Um, why is the roadie setting up ONE solo microphone? Um, why is he bringing an acoustic guitar and setting it by the microphone? Shortly after Coldplay finished Viva La Vida, they hop off stage and come UP INTO THE CROWD, litterally 10 feet away from us. I am hyperventilating at this point. They are RIGHT THERE! RIGHT THERE!! I can see the sweat on their faces!! The crowd quiets down at which point Chris Martin sings The Scientist, acoustic style. Yeah, I promise it doesn't get better than that. After Chris sang, Will Champion sang a little number (not sure what the song was) while Chris Martin played the harmonica. But oh well, it was still so awesome. I am a groupie. What can I say? Freakin' Coldplay, how I love you! !